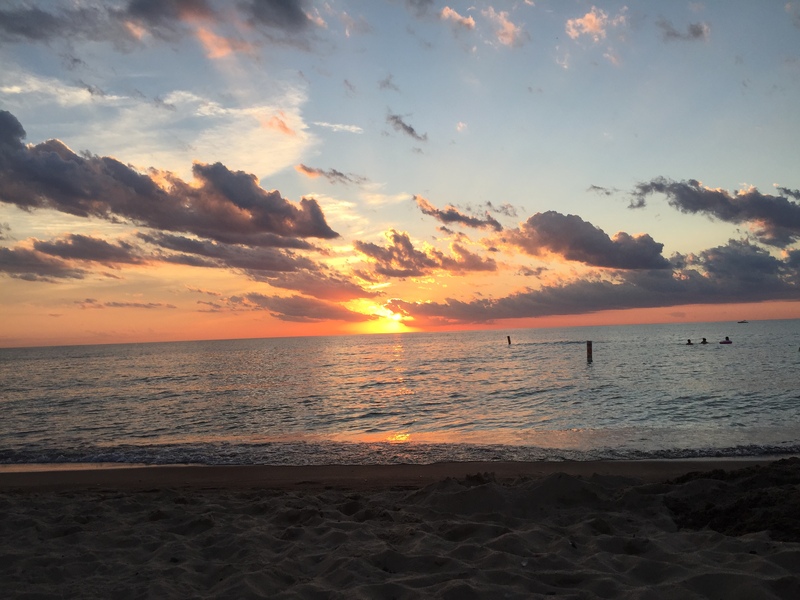 I learned a simple lesson at the shores of Lake Michigan this summer. Some things don’t wait. Sounds simple, doesn’t it? But we live in a pretty on-demand world: I can’t remember the last time I watched some as a live broadcast on TV. My Netflix queue has all sorts of things just waiting for me, lined up like soldiers, ready to deploy when I’m good and ready (I promise, I’m coming for you soon, Downton Abbey! You too, Breaking Bad!). If I can’t answer the phone, I know the person will leave a voicemail or a text; I’ll get back to them later. 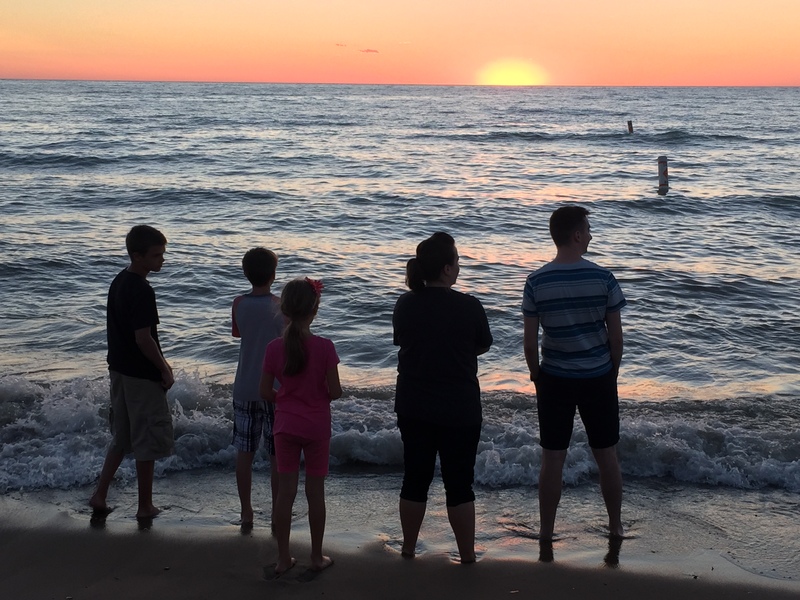 Each evening while in Michigan, we were in a race against time to get dinner on the table and the dishes washed so we could hike the 1/2 mile to the shore to witness arguably the best show on earth: a golden sun descending into placid blue waters. We were past the vernal equinox, and each night the sunset happened a little sooner, a little sooner. We’d emerge from the woods as the sun was still up in the sky, but starting to cast pink and orange shadows across the horizon. The kids and their cousins would run out ahead of us, drawn to the shores and its lapping waves. All across the shoreline, kids were still splashing and playing, mothers and fathers calling out to them from the sand, one hand on their hips, the other hand shading their eyes. My favorite part is when you see, all up and down the shore, the moment when people stop what they’re doing and look out to the horizon. It’s like they know that the sunset is coming, and they know if they don’t stop what they’re doing and look up, they’ll miss it. I found myself watching the people almost as much as the sunset. There they were, lined up in a ragged row: standing, sitting, leaning into loved ones. After an entire day of the sun hanging in the sky, sometimes beating down with unrelenting intensity, it was suddenly retreating, glowing so marvelously that now we want to beg it to come back, or at least linger a while longer. But the sun doesn’t wait. If you miss tonight’s sunset, that beautiful moment in the world reserved only for this night is gone forever. If you missed it, don’t be sad. Tomorrow there will be another one. But you can’t put tonight’s sunset in a queue to be enjoyed later. As I’m trying my hardest to pursue a minimalist life, to let the simple pleasures outweigh the worries and stresses, I think about those sunsets a lot: making my life about creating space so there’s time to look up and watch what is happening before me: that goes for sunsets, growing children, and precious relationships.